TapSnap is bringing the next big innovation in event entertainment to cities across North America, with a ground-breaking new phototainment franchise. Because typical TapSnap events include weddings, corporate events and parties that tend to take place on evenings and weekends, franchisees can run their TapSnap business while keeping their full-time employment. Aspiring entrepreneurs require $30,000 to get started, and can earn over $1,400 from a single booking. Here’s how it works. TapSnap’s giant 42-inch multi-touch screen allows event guests to take their own commercial-quality photos, add personal messages and drawings, and share their creations with the world on social media ‒ all with the touch of a fingertip. 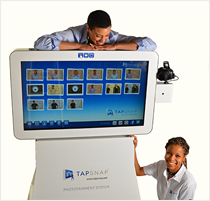 Only recently made possible by the latest advances in multi-touch technology, TapSnap is instantly connected to social media. With over 300 million photos being shared every day on Facebook, TapSnap is designed to feed the surging demand for exciting new pictures. TapSnap franchisees benefit from a centralized reservations center to handle customer inquiries, SnapBook software to manage their schedule of events, and a corporately run advertising program. “We are committed to making your business both personally and financially rewarding,” says McInnes, whose team has over 12 years of experience helping people start their own businesses. His company, DVDNow Kiosks has grown to be the largest independently operated network of movie rental kiosks in the world, with operations in 16 countries. Brad and Alison Rudover wanted “to have the party of the century” for their wedding, held this fall in Vancouver, Canada. The newlyweds are still receiving feedback from their guests that it was the best wedding that they had ever been to.